A time-proven way to skyrocket sales in retail and food services is to invest in POS solution. Point-of-sale system ensures smooth experience with less wait time for your clients and decreases your business expenses. HireRussians has almost two decades of experience in developing POS solutions for a variety of platforms, including Windows, Linux, macOS, iOS and Android, and devices — from ordinary PCs to advanced interactive kiosks. We have domain expertise in developing self-service and information kiosks for telecommunications, pharmaceuticals, fast food and sports industries. HireRussians is skilled in integrating POS systems with payment systems and terminals (e.g. EFTPOS) and in building Heartbeat solutions, allowing to track POS devices across multiple locations. Local server, implemented on Windows-based PC with touch screen + website written in ASP.NET / C#. Local server, implemented on Linux-based PC with touch screen + website written in PHP. Local server + tablet (Android /iPad / Microsoft Surface) + native application in Java / Objective-C / C++ / C#, or instead of native application a mobile web may be utilized. Cloud-based POS software (independent from platform and operating system limitations) + tablet (Android /iPad / Microsoft Surface) + native applications or mobile web. Local server + multi-touch table (Windows, Mac OS or Android-based) + application in C# or C/C++. Local server is not a necessary requirement, but invaluable in the case the Internet connection could be interrupted or when working with sensitive data. With expertise in development both small solutions used in a single location and complex systems that were implemented in large retail chains worldwide, we will be able to find just right way to help you achieve your business goals, without going over the budget. 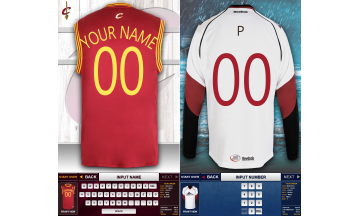 Kiosks located at the stadium allow sports fans to order copies of local teams outfits with customized numbers and names on them. Integrated terminal allows to pay for the order with credit card and get the printed check to pick up the order at a booth after the game when it's printed. Users also can choose the order to be delievered to them by post. 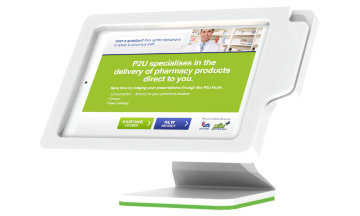 Touchscreen kiosks allow patients to log in the system, scan a pharmacist prescription and choose where and when the order will be delivered. The system processes prescriptions remotely, passing the order to the pharmacy selected to the patient. 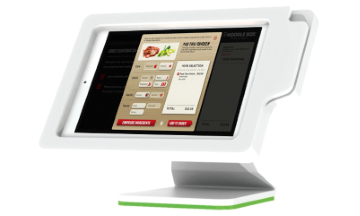 Touchscreen kiosk allows users to customize their meal adding or removing ingridients from the list. Confirmed order can be payed by credit card or by cash over the counter.